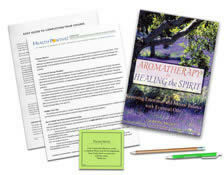 Do you have the Aromatherapy for Healing the Spirit textbook? See your enrollment options above for "I already own the text". Learn how to help clients improve a wide range of emotional and mental complaints through the application of essential oils. This course describes oils' subtle energies and psychotherapeutic properties combined with Traditional Chinese Medicine principles, including the 5 elements and acupressure. It is superbly laid out and has 160+ illustrations as well as easy-to-reference charts. Also available: 3 optional sample sets of organic essential oils @ $20 each. This course does not teach hands-on skills. Please seek additional experience, with a mentor, to add hands-on skills. I loved this course. I had difficult time putting the book down. Found the course very informative and interesting. Very much liked the approval of emotions since it comes up frequently. The linking of aromatherapy with energy work is very empowering for me - and holds much promise for more effective bodywork. This is a great course that breaks down the history, foundations, uses, and results of each essential oil. It is a helpful tool when using aromatherapy in massage sessions to address the clients specific physical or emotional need. I've been practicing professionally for 10 years and found this aromatherapy course a breath of fresh air in its unique approach of applying TCM principles. The depth of this course was good and challenging. Beautiful book, easily read and understood. Practical and useful. Not overwhelming. An excellent resource. Works well with my practice. Great course, highly recommend, interesting, informative. I love the materials and the ease of working at my own pace. Love material provided and prices are just fair. The aromatherapy course was exceptional in quality. The book held my attention and will be a great reference for my practice as well. Clear and concise. I would recommend it to others. Aromatherapy: Restoring Emotional Balance is a wonderful course. I learned very much that can be used and applied into my massage therapy practice. Excited to put to use what I have learned! The book is very nice. I am sure I will use essential oils more often now. Interesting content. Well written course. I loved this course. It was very insightful and opened my eyes to a different way of thinking about dysfunction and disease in the human body. I really enjoyed this course! Very informative and useful. Thank you for making this course available. I work with Essential Oils daily and continue to learn more about their healing properties. I enjoyed the course more than I expected to. I liked the information related to the 5 elements and the yin and yang. I also look forward to utilizing the info regarding using the oils along with acupressure points. Content was presented in a very utilizable format for me. Excellent book chosen for course. Questions are useful for future reference. Great course. Highly recommend. Interesting. Informative. I use essential oils in my practice already. This course has really given me knowledge about how to store oils and the contraindications that some of them have. With more knowledge of oils I can now help my clients even more and of course myself. I enjoyed the book and found the information helpful. I absolutely loved this course. The book and materials were detailed, concise, and fascinating. In addition to learning about a multitude of herbs and plants from which the essential oil is extracted, I especially enjoyed learning about the five elements of Chinese medicine and tradition, and how this can be applied to aromatherapy. I think that this text does a great job of blending Eastern and Western treatments and philosophies in our goals of healing. 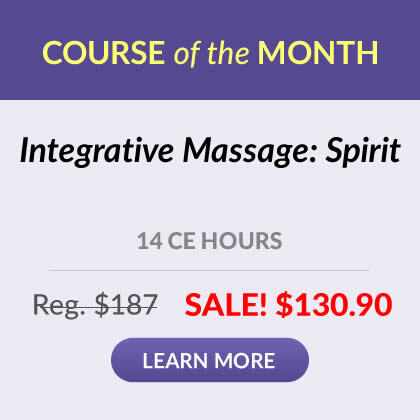 I learned so much from this course....I have practiced massage for twenty five years and this was the best course I have taken on essential oils. Beautiful text book, it will make a wonderful reference and I learn more about aromatherapy. I have studied aromatherapy for years. I still learned an incredible amount of new information. Great class! I learned a lot, and it was well presented. I thoroughly enjoyed the text book. The book is a great reference guide for me to use on a daily basis for work and personal use. A great course, with easy to learn information! Enjoyed this class very much! Having knowledge of proper oil blends for different emotional imbalances will allow me to alleviate some symptoms my clients have. Thank you for a great course and book. I am looking forward to checking out the other aromatherapy/acupressure courses you may have. Keep up the good work! I liked the course and learned a lot from it. The books can be used long after the course is complete. I absolutely loved this. It was hard to put down. There is nothing I would change. Easy to reference back to and presented in a very applicable manner. I will use all of this knowledge for myself, loved ones and in my practice. I truly enjoyed this course (as I have all of your courses). I enjoyed learning of the health and therapeutic benefits of the oils, and the contraindications. In addition to using essential oils (EO) for bodywork, I will also use EOs in diffusers instead of burning incense or candles. This course is very beneficial and informative on many levels. Thank you. This course was the most thorough I have ever taken on aromatherapy. The complex integration of eastern and western traditional medicine yielded fascinating insights about the power of these distilled essences. The workbook is in and of itself, invaluable. I really enjoyed this course! 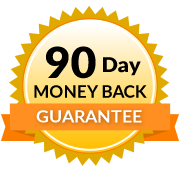 The information was straightforward and very applicable to my practice and overall well-being! I cannot wait to use the essential oil blends for my clients! Thank you for well thought out and interesting material. I was very happy with the course as I was weak in "essential oils." Now I an move forward confidently into deeper levels of study and application. Great Course! Well put together information. I learned much from this course. Thank you for compiling such a treasure trove of information. Especially the segment on Chinese Medicine. I'm much more open to furthering my education, possibly becoming an Herbalist while furthering my knowledge in the modality of Aromatherapy. Thanks again and God bless you all for putting out great educational materials! The text for this course is excellent and I will be referring back to it frequently and for years. The book was a little over the top with content, but may be what some people are looking for. I preferred the printout for the practical information. Overall a good experience. Thanks! Great book! Will reference often. Name the essential oils that should not be used under any circumstances and list the recommended precautions for providing aromatherapy to people who have sensitive skin, infants, children and pregnant women. Identify the best methods of purchasing and storing essential oils. Recognize what essential oils are, how they get into the body, how they work on the brain to affect the mind, and how they complement massage and bodywork. Recognize the basics of using essential oils along with Oriental Medicine and astrological principles. Identify the therapeutic properties and most valuable uses of at least 10 popular essential oils. Recognize how to blend oils for restoring emotional and spiritual balance. Identify the essential oils and bodywork techniques that are recommended to relax the nerves, settle the mind, calm and reassure, improve thinking and memory and boost morale. Identify the essential oils and bodywork techniques that are recommended to reduce anger, empower and uplift the spirit and encourage love and connection. Identify some of the essential oils and bodywork techniques that are recommended to encourage love and connection. BRAVO! And many thank yous for your excellent courses, for the opportunity to further my education at home and for your prompt, efficient and professional staff.